The J.P.Morgan BAR team are in Naples preparing for the final event of the 2012-2013 America’s Cup World Series. 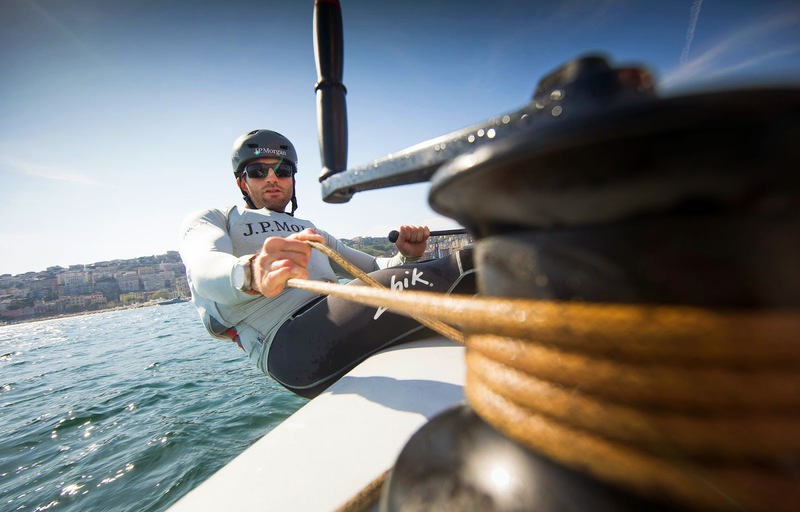 Skipper Ben Ainslie updates us on the programme and what has been happening in the six months since the last event. Six months ago the road to the America’s Cup felt pretty extreme. In October we finished second overall in the second of the World Series events in San Francisco having finished 10th in the one before which gave all of us at Ben Ainslie Racing a big boost. But then came the big shock a few weeks later when ORACLE Team USA’s AC72 capsized. This was not only a big blow for the team. A detailed schedule is a crucial part of any America’s Cup plan where every day really does matter, especially in such complex and untried boats. But with a wing and a boat in pieces we had to rebuild the plan as well. Fortunately I’ve been through the cycle a number of times before and have seen it from different perspectives which makes it easier to deal with the uncertainties that surround any Cup cycle. I’m also pretty confident that all the key players in this Americas Cup realise that and are looking to improve the situation moving forwards. Being here in Naples, for what will be the only AC World Series of 2013, is very important to remind us all what the essential steps of Cup campaign are. As it turned out this actually brought the team closer together and I think, in some ways, we’re better for it. But it also meant that my role in the team, getting to grips with helming an AC72, was delayed as well. Planning for any future America’s Cup beyond the current cycle is always difficult because of the nature of the event. He who wins makes the rules and while there is often plenty of good intent to maintain continuity for the next Cup cycle, it’s not something anyone can guarantee. This makes it very difficult when you are trying to develop good business relationships to bring sponsors on board. Clearly this is important to build commercial foundations for the team to secure key people in advance. In some ways this produces a tricky cycle to break as team backers want to see a strong team of key players in place. At some point people on both sides have to buy into the team vision and goals. This takes time and has occupied a good deal of the last six months, but I’m very happy with the way things have been going. The planning, the racing and the shore side activities really help to focus our efforts throughout the whole team. Certainly as a sailor it’s always good to get out onto the race course and compete, especially as it is something we haven’t been able to do for a while. When We have been out withORACLE Team USA, our time afloat has been much more about testing than racing. Having said that, I have been out sailing a foiling Moth a few times with the other guys, along with the ORACLE Team USA’s 45’s, this helps with understanding the issues of foils and is also a reminder as to how versatile you need to be at the moment to understand the implications of one of the biggest changes in the Americas Cup. The next few days will be a great way to get the machinery of our J.P.Morgan BAR campaign running. We’ve had tremendous support from our sponsors J.P.Morgan and this series gives us an opportunity to further develop that relationship with a big guest programme that rolls into action for the duration of the event. Even though this will only be our third event in the AC45, we can compete with the best which gives us a serious datum to play to. Sometimes the Cup can be the most frustrating experience in sailing. The time it takes, the uncertainty and the disappointments when things that you can’t influence change and pull the rug out from under your feet can make you feel like you’re riding the biggest roller coaster in sailing. On the plus side I’ve experienced a good deal of this since my first involvement with the Cup in 2001 which helps to put things into perspective and make me more patient than perhaps I might have been previously. It’s true, the Cup can be intensely maddening, but get it right and it can be the most satisfying and rewarding experience in sailing. ORACLE TEAM USA SLINGSBY (Tom Slingsby) – 165 pts.